On the Outer Banks, there's no shortage of off-shore winds or good swells! After thousands of years, the same forces that formed the Outer Banks are still twisting and reshaping the coastline today. Bring your board or rent one from a local OBX surf shop, and experience some of the best waves on the east coast! Outer Banks surf shops can be found in every town and village, from Corolla to Hatteras Island. In addition to surfboards, you'll also find brand name surf apparel, wet suits, rash guards, wax, DVDs, jewelry, t-shirts, and more. Outer Banks surf shops on this page are arranged by town, north to south. 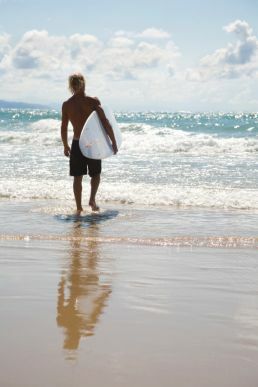 Corolla Surf Shop offers a wide variety of surf equipment for purchase and for rental. A fully stocked skate section with apparel and equipment. 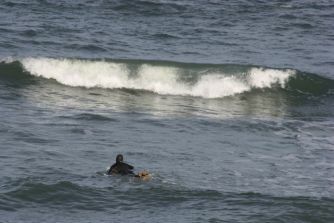 Surf lessons are also offered by CPR certified and experienced surfers. Kitty Hawk Surf Company is one of the leading destinations for new and used surf, kayak, paddle boarding and skim gear from industry-leading brands. They also carry the latest sportswear, footwear, and surf lifestyle apparel and accessories for men and women. Outer Banks Surf Shop has a large selection of surf clothing and accessories, longboards, bodyboards, skimboards, and more. This Kitty Hawk location is the main surfboard factory of WRV. Offers a full service surf shop and apparel for everyone in the family. The Pit caters to a wide array of boardsport passions including pool, street, and longboard skateboards, and the Carveboard line of cross training boards. Fashion blends with function at the beach, and our buyers excel at keeping you looking good AND ready to ride. Cavalier Surf Shop offers a quality assortment of surf and skate equipment, accessories and apparel, as well as general beach gear and some fun novelties. Self proclaimed “Frog House of the Outer Banks” you’ll find all of your surfing, swimwear and apparel needs. Hoodies for the entire family, headphones, sunglasses, surf and skate needs. Fox Watersports is the number one place on the Outer Banks for all your surfing, windsurfing, SUP, and kite surfing needs new used or rentals. Providing surf lessons, apparel, and surf gear rentals. Ride Hatteras is a locally owed independent water-sports rental and retail store located in Avon, Hatteras Island. The shop offers new and used gear for surfing, windsurfing, kite boarding and paddle boarding, in addition to surf apparel, rentals and lessons for all skill levels. REAL offers instruction on surfing standup paddleboarding and kiteboarding. REAL offers group lessons, private lessons and/or 3 day camps. They also offer a full service watersports shop and clothing for the entire family. This classic, surf-only shop is the place to get your own Hatteras Glass custom surfboard. They rent bodyboards, surfboards and standup paddleboards and offer lessons for adults and children. 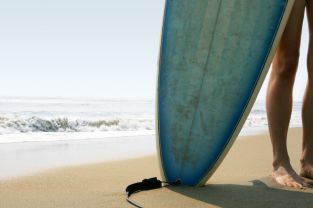 If your board happens to get dinged up, Rodanthe Surf offers all types of board repairs. They stock major brands of surf wear for men and women, and everyone loves our original logo t-shirts for all ages.